It is not every decade that the Philippines is blessed to be visited by a Pope. The last two visits were in 1995 by Saint Pope John Paul II during the World Youth Day, then just recently by Pope Francis. Looking back 20 years ago, I took part of the World Youth Day activities. In fact, I was part of the official choir who seated at the Quirino Grandstand's front bleachers, just by the right side of St. Pope John Paul II. I saw the Pope visibly from a distance while he was celebrating the mass and I felt really blessed for the opportunity to sing officially for the World Youth Day. 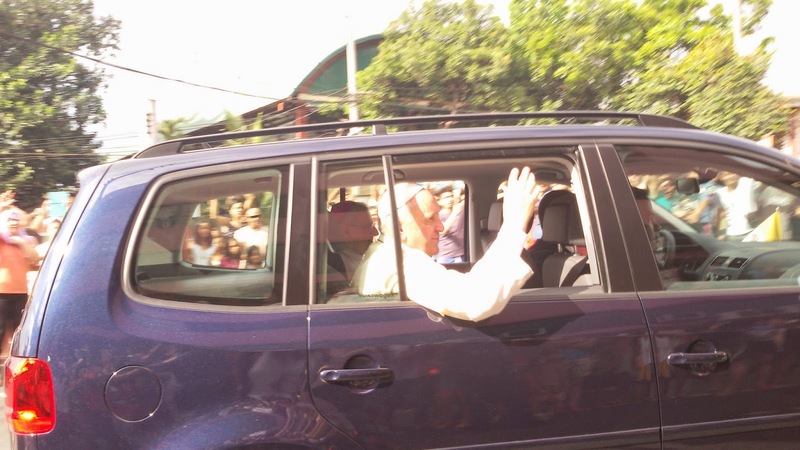 But not as visibly close as my encounter with Pope Francis during his recent visit to the Philippines. On the second day of his visit, he was scheduled for a quick visit to Malacanang to meet President Aquino. 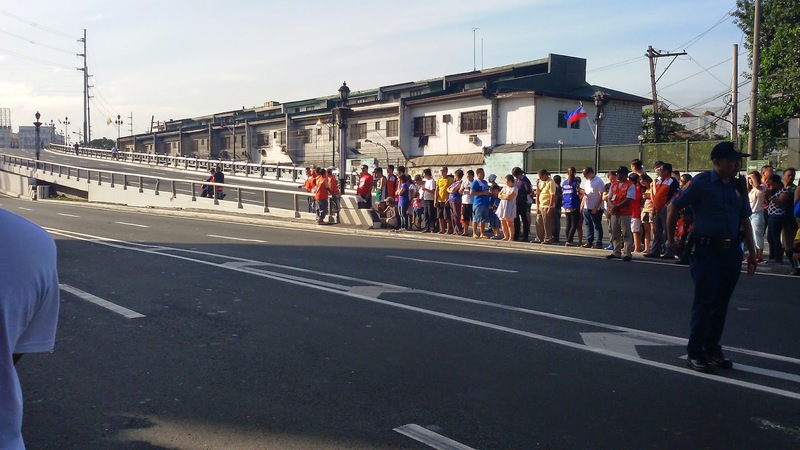 Together with our neighborhood friends, we decided to go to Nagtahan Bridge which was very close to home, just one trike away or it could even be a walking distance. We were up as early as 6 AM to wait for his estimated arrival to the venue at 9:30 AM. See that white line where the police is standing? I was right that very spot after I took this photo. There were also people at the other side of the bridge waiting for Pope Francis to pass by. 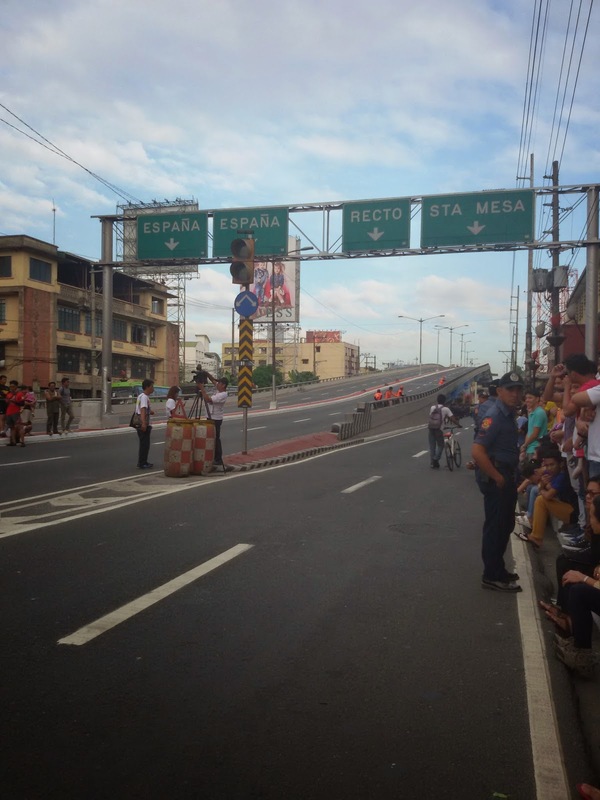 When we went to Nagtahan that early, people were just starting to settle in vantage positions to see Pope Francis. So did we. It was a treat to see neighbors who were there for the same reason, neighbors you don't get to see nor talk to often. That almost four hours of wait was all worth it. 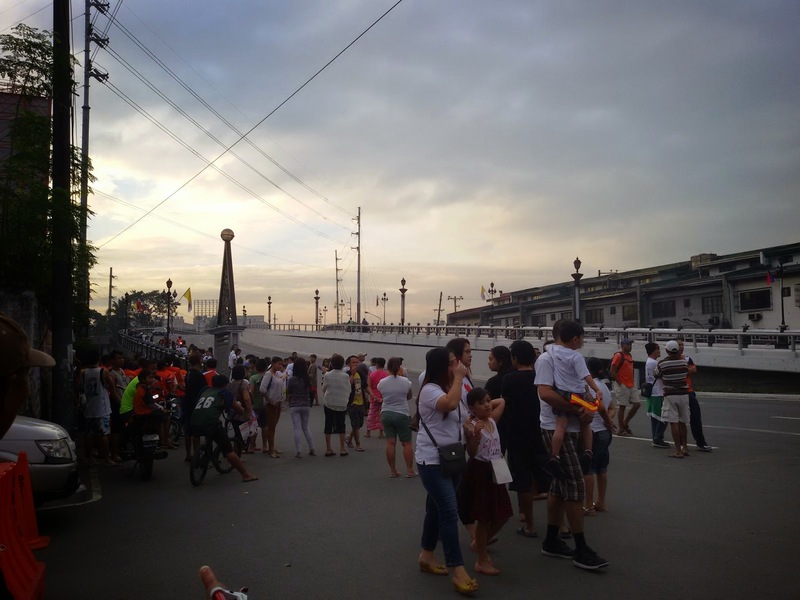 After some chitchats with a number of people, a few cups of taho and pambobola made with the policeman who served as a human barricade (and the only person in between me and the Pope), he passed by right in front of me. The much awaited moment, Pope Francis was passing by us. We all felt very blessed by this rare moment. Goosebumps all over. The feeling was amazing, it's overwhelming actually! It was a surreal experience. A life event which no words could exactly describe the overwhelming feeling I had at the sight of our dear Pope Francis. He, who is the Pope of the times, who judges no one regardless of gender, age, economic or civil status. How could anyone not be endeared to him? He only speaks of love, kindness, compassion, simplicity, humility, honesty, and service. With due respect to others who think the visit of the Pope is already equivalent to idolizing other god than the main man Himself, Jesus Christ, and who think the Pope's arrival was turned into a national concern worthy of the three day holiday, I disagree with you. 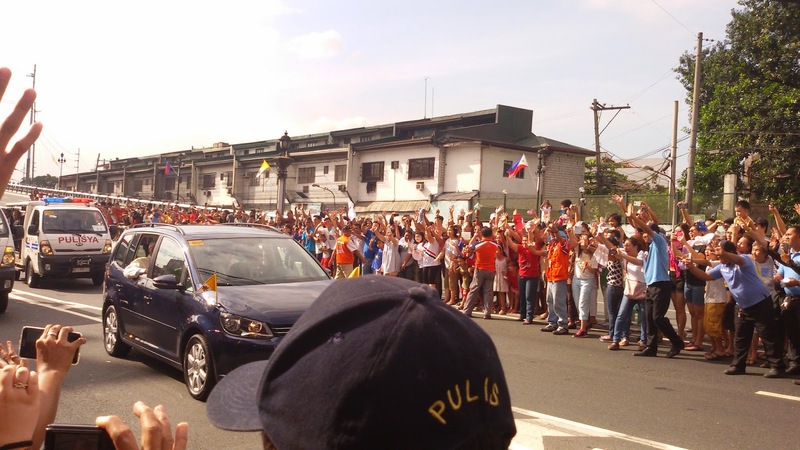 The Filipino Catholics are joyous of the Pope's presence among us. We are united with the pope in celebrating and sharing the love of Jesus. It's very far from idolizing the Pope in place of Jesus Christ. Let respect for each religion or sect reign over any hatred or righteousness. Personally, the most important thing is we believe in a higher being, in one creator, whatever religion we come from, whatever name we call our God. At the end of the day, it will all still boil down to how one is living his life according to what his religion teaches. Are you good, kind, compassionate, humble and honest, not only to others but to yourself? I hope yes, and if everyone in the planet is indeed good, just imagine how peaceful and beautiful our world would be! Don't you think?